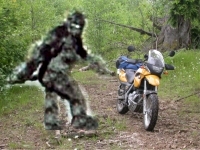 The Puget Sound Dual Sport Enthusiasts was formed in 2003. It is a list group comprised of more than 1,000 Pacific Northwest riders. Riders of any make or model of dual sport/adventure bike are welcome to join the list. We typically send out monthly emails during the spring, summer and fall to alert the list about upcoming scheduled rides, rallies, where we’ll be and other riding and learning opportunities. Join the mailing list to get all the latest updates on rides and events. We typically ride together once a month from April to October. Rides are announced by email on short notice to ensure we don’t wind up in a soaking wet situation. That email typically comes out the Wednesday before the ride which will normally be the following Sunday. We utilize this rally as a chance to gather and enjoy time together over several days in one location - Hood River, Oregon. Nestled between two volcanoes, the dual sport and adventure routes are endless and range from easy-breezy to technical single track. Riders are able to select routes each day that suit their ability. This is also a great time for us to meet up with other dual sport/adventure enthusiasts who come in from all over North America. Special guest speakers often include top names in the sport. The fairground where the event is held features complete camping facilities, electricity, running water and hot showers at no additional cost. This annual tour changes routes each year, exploring all areas of the Pacific Northwest. In the past the tour has criss-crossed areas like the Cascades, the Oregon Coastal Ranges, Hells Canyon, the Olympic Range, Central Washington, Central and Eastern Oregon, and the Columbia River Gorge National Scenic Area. Riders are provided options each night for camping, motels or hotels. The routes are designed so fuel is never an issue, with both lunch and evening stops in small towns or cities with ample services. Many of our rides use routes out of the Sound RIDER! 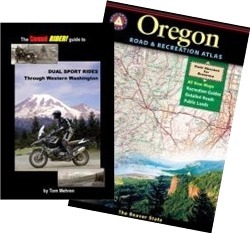 Dual Sport Guides available from their online store, where you can also pick up the latest Benchmark Atlases, both invaluable investments for anyone wanting to do dual sport adventure touring in the Pacific Northwest. © 2003-2018 Puget Sound Dual Sport Enthusiasts All rights reserved.